Yoga is the process of life itself. The yuj or joining with the self. Here the self must be understood as the Atman. Check The Experiential Knowledge for more clarity on Atman and Brahman (which are the the same principles). Many people are trying to trace the beginning of Yoga. This would actually take us to the beginning of the universe itself. To the beginning of the conception, where consciousness was separated from itself by the veil of ignorance. We will leave the conception of the universe for another blog entry but we can understand from this that Yoga, the process of self realisation, began the moment the self was covered from the reality of its own existence. Yoga is being practiced by all regardless of their spiritual propensity. This concept would seem confusing to most who firstly misunderstand what Yoga (Pronounced as ‘Yog’) really means. Check Causes of Misinterpretation for a better understanding of yoga. Yoga is the entire process of Self Realisation. Self Realisation is a process which all beings are constantly going through whether they are conscious of it or not. There is a constant flux of information exchange between the universe and our outer experience. The Atman which is at the center of our being is a constant observer of our realities. 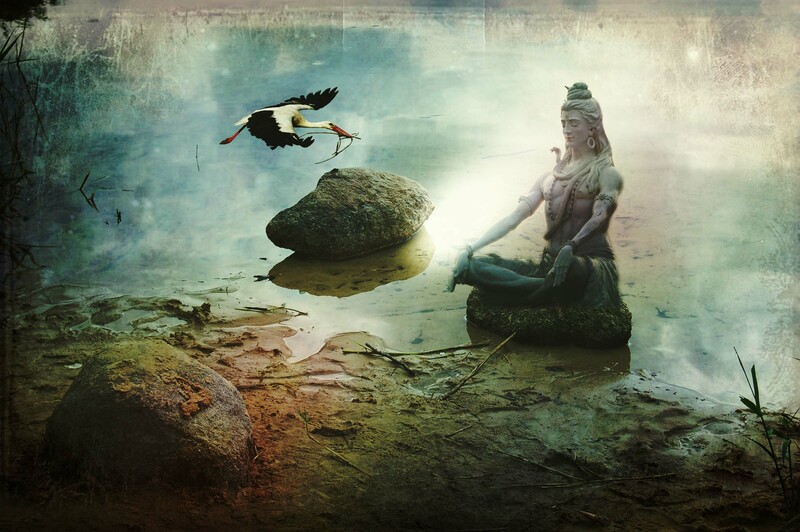 Atman is a drop in the shore-less ocean of Brahman. Hence it is Brahman that is constantly observing our reality. We are continually receiving the lessons that are so simply codified in the primary programming of the universe. The fundamental laws of truth that govern the universe, like the law of cause and effect are understood to be coded into the universe right at the moment of its conception. (This is according to Samkhya Philosophy, the cosmic science expounded by great Vedic Rishis. Rishi Patanjali the author of the famous Yogasutras was a follower of the Samkhya tradition.) Hence the powerful law of Karma coupled with our ability of free will to create more causes, en kindles such a supremely intelligent environment of learning which we know as the universe. When we are practicing yoga without any awareness (i.e.we are not aware that we are bearing the effects of our own causes) we carry on creating similar causes that bear similar effects. The same realities keep repeating themselves until this wisdom of karmic repercussions of ones actions descends upon a being. It’s the reason when someone asks us “what’s going on?” we reply “same old”. Consequently an awareness of cause and effect generates which can greatly enhance the evolution of an individual. Initially, one may begin to create positive causes so that one experiences positive effects, but eventual evolution will take one beyond the desire to reap the fruit of ones action. This is called Karma Yoga. Selfless service is called selfless just for that exact reason. One begins to lose the attachment with the “I-sense”(which most of us attribute the self as), making them more selfless. Though if one actually understands the true meaning of Self as the Atman, then we may call this service to be self-full service, as it would stem from the knowing that the self is actually serving itself, wholeheartedly without any selfish desire to reap its rewards. So no matter what we’re experiencing, the power to make an observation, as a viewer of the experience rather than the doer, will always lead us to insights of how we can expand our sense of self. The broader our sense of self becomes the more power our will and thoughts receive. It is the reason the most realised yogi’s possessed powers beyond the imagination of the human mind. These are called Siddhi’s. A true Yogi is never attracted to these powers as they are said to make one egoistic and attached to simply being a powerful entity. In all yogic teachings these powers are to be shunned so as to reach the ultimate state of absolute realisation (Nirvikalpa Samadhi). After absolute realisation a yogi is said to go beyond the universal laws of causation. his conditioned identity(Atman) will then be truly merged with the ocean of Brahman. We must then respect the paths of all those who surround us. Rather than judging them to be good or bad, lost or realised, we must know that in the deepest reaches of their heart sits the all knowing Atman which is bringing to them all the experiences that they must have before they become fully aware of their true identity. All must find comfort in the fact that our everyday experiences are always taking us a moment closer to being self realised. Each being must be shone and polished like the brightest speck of gold before it can consciously merge with the ocean of eternal bliss and conclude its saga of birth and death. We can then learn to be grateful for every day, and every experience as it is truly bringing us one step closer, to being who we really are. Not Human, but Brahman itself.